Arthritis pain in knee hurts and worse is very disabling. The ends of the weight bearing bones of the knee, the femur and tibia, are lined with a shiny, hard, super slippery hyaline cartilage surface, not to be confused with the meniscus located inside the joint. Look at the end of a chicken drumstick to see what it looks like. An injury to the knee can damage this weight bearing cartilage lining of the joint, and in more severe cases the underlying bone. That could be a sporting injury, such as torn ligaments, a motor accident, or overuse, though obesity is one of the main causes; simply too much weight pressing on the cartilage. A hole wears through the articular cartilage prematurely causing severe disability in pain; it often occurs around fifty. This cartilage does not have the capacity to heal spontaneously resulting in the development of various orthopaedic techniques to induce the bone marrow to produce stem cells that can produce new cartilage. Distraction of the knee joint for a time with an orthopaedic device which still enables you to walk has merit; unloading those cartilage ends of the bones does allow for regrowth. Even more effective is weight loss; in fact it's scientifically proved to be the most workable treatment. So, what are the symptoms of arthritis in knee? When the injury is to both the cartilage and underlying bone, there is stiffness, swelling, pain and frequently an inability to bend the knee. The lady with the xrays below walked with a severe limp when she first arrived at our clinic. In her early fifties. This page was last updated by Dr Barrie Lewis on 22nd March, 2019.. 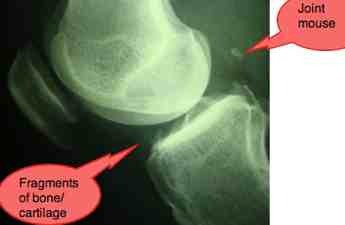 In the early stages of arthritis pain in the knee, when there is injury to the hyaline cartilage only, there is little to be seen on xrays which can't see the defect. More severe degeneration of the cartilage can only be detected by a narrowing of the joint space. This is arthritis and knee pain in the making. 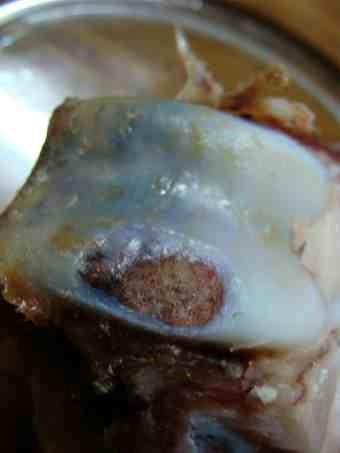 See the raw bone under the cartilage? However, using a technique called arthroscopy, surgeons can look inside the knee and "see" the hole in the cartilage. A lesion of this size will certainly be causing symptoms of arthritis in knee. Widuchowski et al reported that fully two thirds of these patients had erosions of either the cartilage lining of the femur or tibia, or cartilage and bone lesions. These holes have little potential to heal according to the research, presenting a serious clinical challenge to your doctor or chiropractor. Permanent disability is a reality. The single most effective, and most neglected treatment, is pure and simple, weight loss; except it's not easy. Patients it would seem would rather go through the pain, expense and danger of a total knee replacement, than lose 10 to 20 kg, but sometimes far more. Having examined many of the victims of minibus accidents in South Africa, some months or years post trauma, I have come to the conclusion that a fractured tibia or femur very frequently results in arthritis pain in the knee. What seems to commonly occur is that the fracture is obviously the first injury that has to be addressed, and is usually done quite adequately orthopaedically in most hospitals. However, once the plaster cast is removed, it appears to be the exception where other soft tissue injuries to the hip, knee or ankle are sought. When there's been enough force exerted to fracture a bone, there's inevitably associated ST injury; ligaments or menisci are damaged; untreated, arthritis is inevitable. If you've had a fracture of the leg, always ask a competent chiropractor or physician to carefully examine the related joints once the break has healed. Otherwise you may well be faced with degenerative knee arthritis, or of the hip or ankle, in the future. Worn and painful limbs aren't fun, and the disability is even worse; much of it could be prevented with early treatment. Worse, research now shows that how fast you can and do walk will directly affect how long you live, and whether you lose your marbles or not. Poorly managed arthritis pain in knee has a serious knock on effect on your whole outlook. Whilst total removal of a damaged meniscus is not common today, it was common practice in the past. Damage to the meniscus, or total menisectomy, means that the cartilage of the femur presses directly on the cartilage of the tibia. 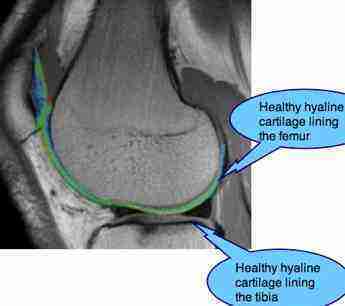 It's not long before arthritis pain in knee is a reality as a hole wears in the cartilage. 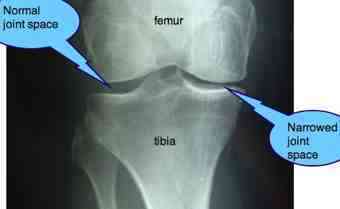 There is convincing radiological research that a short leg is one of the causes of both knee and hip arthritis. Oddly, it might be in either the short or the long leg. But certainly, if you have a short leg, whether caused by a fracture of the leg, a fallen arch in the foot, or simply a leg that grew more slowly that its mate, you are more prone to knee arthritis. A simple insert in the shoe is the answer, but a professional should decide how thick it should be, and whether it should run the length of the shoe, or just under the heel. Just a soft insert in the shoe would help. Leg length inequality research confirming this is not just hot air. In the photograph above you can see small pieces of cartilage that could at any moment break off. These pieces of cartilage are not visible on X-ray but they float around in the synovial fluid in the joint, sometimes jamming between the condyles of the femur and the tibia, causing locking and pain. Sometimes larger pieces, consisting in part of bone may break free, and are then visible within the knee joint. In the jargon, they are known as "joint mice," causing sometimes severe locking of the knee. Dr Richard Steadman developed a new technique some thirty years ago for the treatment of young athletes with weight-bearing cartilage lesions of the knee. Tiny fractures of the bone were induced allowing stem cells to seep through the fracture from the bone marrow to the site of damaged cartilage. These stem cells have the ability to replace the damaged hyaline cartilage, but only with fibrocartilage which is less resilient than hyaline cartilage. The technique is much less effective in patients older than 45, obese patients and in the case of a large cartilage lesion greater than one inch. The stem cells are extremely susceptible to pressure in the early stage and it's vital the patient goes on crutches for a minimum of six weeks. Active, non weightbearing exercises of the knee begin immediately after the surgery, together with quad strengthening exercises. This movement of the knee ensures that the vital nutrients and oxygen in the synovial fluid that feeds the newly forming cartilage are adequately replenished. Most of the improvement in symptoms after microfracture occurs in the period from 6 to 12 months post surgery. Arthritis can't be treated, right? You must learn to live with the pain, not so? That's absolutely untrue; arthritis can't be cured, that's so, but then neither can diabetes. Can raised blood sugar be successfully treated? Indeed, it can but these are in the main lifestyle disease; without ringing in changes to your way of life, what you eat and whether you exercise, both will cripple your life. Add smoking and it's game over. "It is reported that hospital leaders in North Yorkshire said that patients with a body mass index (BMI) of 30 or above – as well as smokers – will be barred from most surgery for up to a year amid increasingly desperate measures to plug a funding black hole. The restrictions will apply to standard hip and knee operations." There is compelling scientific evidence that the obese suffer far more from arthritis. In the case of arthritis pain in knee it's simply because of the cartilage wearing out as the lining of the femur presses down unerringly on that of the tibia. However, there's far worse to come. Adipose tissue releases toxic chemicals into the body that increase inflammation not only in the joints, but in all the organs. Arthritis and obesity are inexorably linked. but in a larger part it is what the victim has done with his world." There are indications that a substance in broccoli called sulphoranin has not only strong anti-malignancy properties but also those of reducing the inflammation of arthritis. Make sure broccoli is on the table at least once a week. This chicken broccoli recipe combines the chicken bones and broccoli anti-arthritis properties. I make it into a delicious soup. 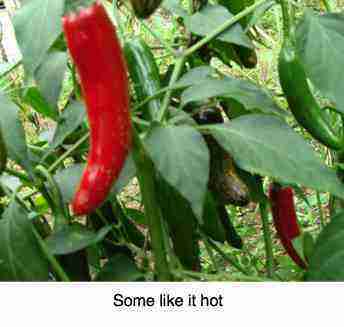 Compel yourself to acquire the taste for anti inflammatory chili if you have any painful, angry condition in the your body. Half a dozen jalapeno plants in amongst your flowers are a delight to the eye and a boon in the treatment of inflamed joints. Whilst arthritis pain IN the knee joint is clinically a challenge, under the kneecap (patella) it's very readily treated with chiropractic. Clarke's Test for arthritis under the knee cap. There's a place for NSAIDs such as Brufin in the treatment of arthritis pain in knee, but do be aware of the dangers. Taking them for any length of time can make a serious hole in your stomach. Taking dual antiinflammatory drugs such as aspirin + brufin is just asking for trouble. Interesting research shows that the essential fatty acids known as omega 3 oils have a very similar mechanism in dealing with the pain and inflammation in joints as NSAIDs. Without any side effects. Omega 3 fatty acids are "essential". If we don't get them in the diet, we will die. They constitute 50% of the fat in the brain. Fish oil ... look for the fatty fish like salmon. Flax seed nutrition information ... dead easy to make at home. Pecans nutrition ... when did you last crack a pecan nut? Learn the knack. Butternut squash soup recipes are rich in omega 3. What's clear is that nothing works all the time with arthritis pain in knee, and in fact most treatments are not very successful. Even total knee replacement is a relatively risky and oft not very successful procedure. Many patients tell me they wish they had never gone through with it. Arthroscopy knee surgery too is not the great panacea it's often made out to be. Nor can I promise you that Chiropractic Help will adequately treat your arthritis knee pain either. Exercise, weight loss and omega 3 fatty acids are the only treatments that will always help, with no risk of aggravating the problem in your knee... for the rest, patient beware! Often the treatment may be worse than the disease. The theory behind these two natural compounds, glucosamine and chondroitin sulphate is good; they are the basic ingredients of cartilage, but the research that they are effective is weak, and often funded by the companies that manufacture them. Either there are unknown microcompounds that come with them where they are found in nature, and missing from the manufactured product, or they are actually digested and broken down into the constituent amino acids in the stomach. In any event, it would be better to make your own chicken bones bouillon where the research from Harvard Medical school is strong in the treatment of your arthritis pain in knee. The oleocanthal in olive pate is a strong natural anti inflammatory. Acute knee trauma is common in sporting countries; to prevent the onset of arthritis pain in knee is important to get your injury properly treated; consider chiropractic too depending on the diagnosis.